Often people with disabilities are utilized by folks without disabilities (sometimes referred to as allies) to advocate on behalf of the disability community for any given issue. This is necessary given the underrepresentation of people with disabilities in the halls of power. What happens when someone with a disability starts saying things that allies don’t like or saying them in a way that allies don’t agree with? Should allies shut them down and tell them how to behave and what to say? Why is it awkward, even for our allies, when someone with a disability takes power and speaks their truth? 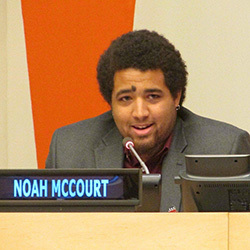 Noah McCourt is a staunch advocate who we may not all agree with all the time. But that does not mean we shut him down or attack him, it means we pose a counterargument that is free of ableism and paternalism. This may come as news to some: people without disabilities do not know what is best for people with disabilities. This “I know what is best for you” mentality is baked into dominant culture and exists in nearly every institution that is tasked with supporting people with disabilities. People with disabilities are the experts on disability. Allies exist to support people with disabilities and amplify their voices, not tell them how and when to act. For the last four years, this time of the year has been dedicated to stupid depictions of us, and a bunch of “advocacy” in which we are never consulted about what we want. When was the last time you saw someone say they wanted to help donate to find a cure? For many people the answer is probably “yesterday” When was the last time you asked someone on the spectrum whether or not they wanted to be “cured”? A lot of folks talk about autism, but rarely are we asked what we think or they have some token neurodivergent person to hold up as an ultimate symbol of “peace” and “acceptance.” We aren’t consulted about what language we want used in regards to us, we aren’t consulted about advocacy. We aren’t consulted about accommodations. We aren’t even consulted about how we are celebrated. Sure it’s kind of cool to get Blue Cream Cheese from Einstein’s Bagels but at the end of the day nothing is gained from that. If we’re going to have “Autism Awareness Month” than let’s do it right and actually take the time to be more than “aware” about autism and celebrate the value that neurodiversity adds to the human experience in ideology, in perspective, in relationships and in our communities. I’m not riddled with disease because I have Autism. I am not afflicted by Autism and I don’t suffer from Autism. How many people on the Autism Spectrum does God have to create before we as a society consider the fact that he wants them here and that they share in the same inherent rights to life, dignity and respect as anyone else? In short, don’t just be aware, be appreciative not because it’s the charitable thing to do but because individuals with Autism deserve to be appreciated and heard without being asked to change or fit into a box of societal norms. Appreciation is more than awareness and it’s not attempting to fix our brothers, sisters and neighbors on the spectrum. Rather it’s celebrating the voices, talents and diversity of individuals on the spectrum.